Summer is here! This recipe is similar to my pancake recipe with some minor alterations. 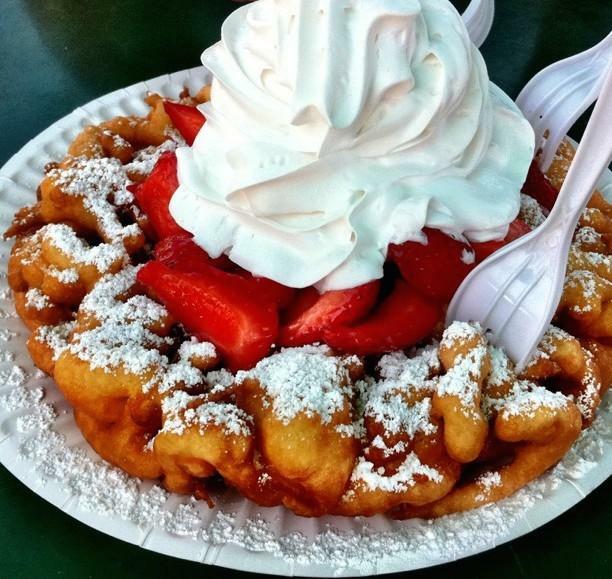 It makes for a delicious batter for light, fluffy and crispy funnel cakes. If you close your eyes while eating, you’ll think you’re at the fairgrounds! 1- In a mixing bowl, mix flour, baking powder, ¼ tsp cinnamon and salt. 2- In another bowl, stir in milk, brown sugar, butter, egg and vanilla. 3- Combine liquid into dry ingredients until smooth. Let batter stand for 20 minutes and then pour into a Ziploc with a corner snipped off. 4- Combine rest of the cinnamon and sugar and pour onto a flat plate. 5- Heat strawberry jelly and put in a squeeze bottle. 6- Heat frying pan with oil - MAKE SURE OIL IS HOT BEFORE PROCEEDING! Gently squeeze batter into oil creating a lattice shape. Flip cake when bottom is golden brown and repeat. When both sides are golden, remove from oil onto a paper towel to drain. 7- While cake is hot, dredge it in the cinn-sugar, top with jelly from a squeeze bottle and then top with powdered sugar and serve. YUMMM!! 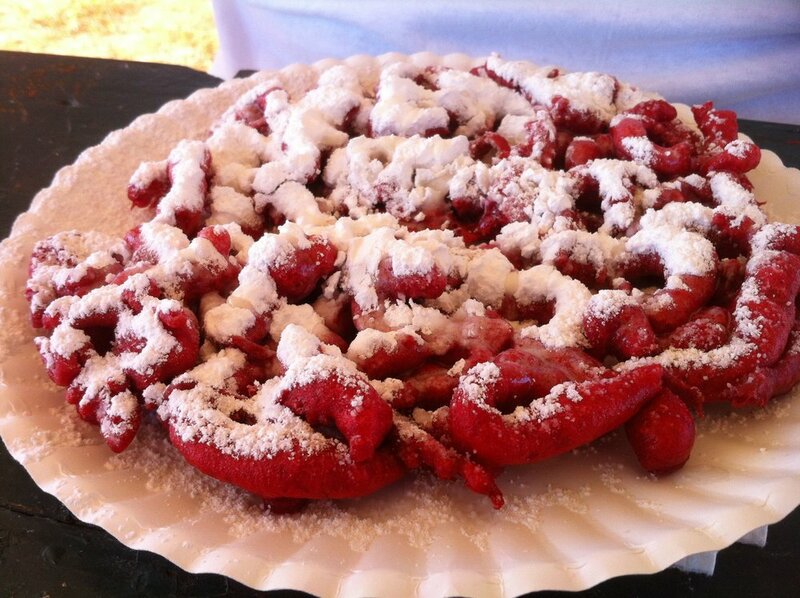 This is an unconventional combo of two awesome treats – Red Velvet and classic funnel cakes – BUT WITH A TWIST! This version uses beets to provide the signature red color instead of food coloring! By doing so, not only are you eliminating a useless ingredient, you’re adding one that’s high in potassium, magnesium, fiber, iron; vitamins A, B & C and beta-carotene. Beets also help prevent cancer and are a natural energy booster! AND TASTE AWESOME!! Heat oven to 350. Wash beets and wrap in foil. Bake until tender - cool and peel. Place one cup of chopped beets (with juice) into a processor. Purée w/ milk, lemon juice, vinegar and vanilla until smooth. In another bowl, combine flour, cocoa, baking powder & salt. Set aside. In the bowl of a mixer, beat butter and sugar until creamy. Beat in eggs one at a time. Alternate adding flour mixture and beet mixture to butter mixture. Scrape down the bowl after each addition of the wet ingredients. If batter is too loose, add additional flour until you achieve desired consistency. Let batter stand for 20 minutes and then pour into a Ziploc with a corner snipped off. Combine cinnamon and sugar and pour onto a flat plate. Heat frying pan with oil - MAKE SURE OIL IS HOT BEFORE PROCEEDING! Gently squeeze batter into oil creating a lattice shape. Flip cake when bottom is golden brown and repeat. When both sides are golden, remove from oil onto a paper towel to drain. While cake is hot, dredge it in the cinnamon-sugar, top with powdered sugar and serve. YUMMM! !